There’s nothing worse than a mobile disco with awful speakers, poor sound quality and tacky lighting. So here at Dancefloor DJs & Events we take great pride in making sure every one of our DJs uses top of the range, professional & reliable equipment as standard. 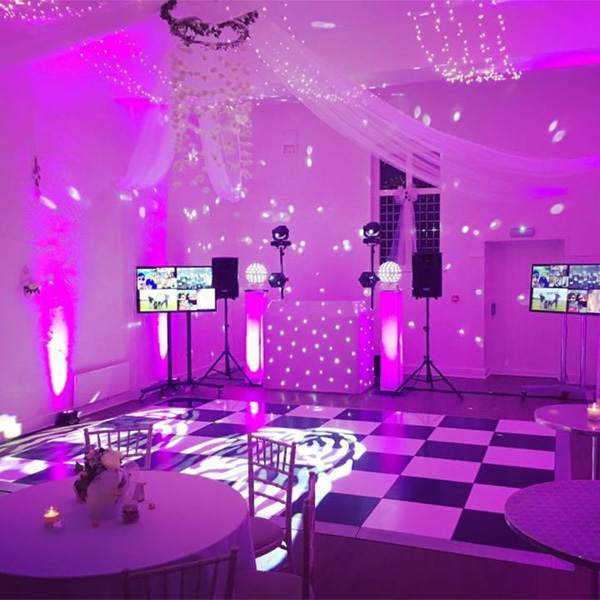 If however you are also looking for something extra to add the WOW factor to your event, we have a fantastic range of special items available for hire. Please browse below to see the great selection of extras we have to offer you. We use the latest in sound and light equipment using brands such as Martin, Numark, RCF, Pioneer and Allen & Heath. All of our equipment is PAT (Portable Appliance Tested) on a yearly basis. Certain venues may wish to see a copy of our PAT certificate which we are quite happy to do so. For your peace of mind we carry a back up of all the essential items that we use such as CD players and thus if for any reason an item wasn’t working we would have a standby unit on-site. Like the look of our equipment?